The world runs red! Abram Adams' former teammate ¬- the long-lost cosmonaut Myshka - has returned from deep space...and, seemingly overnight, the former Soviet Union has taken charge as the globe's preeminent economic and military force. 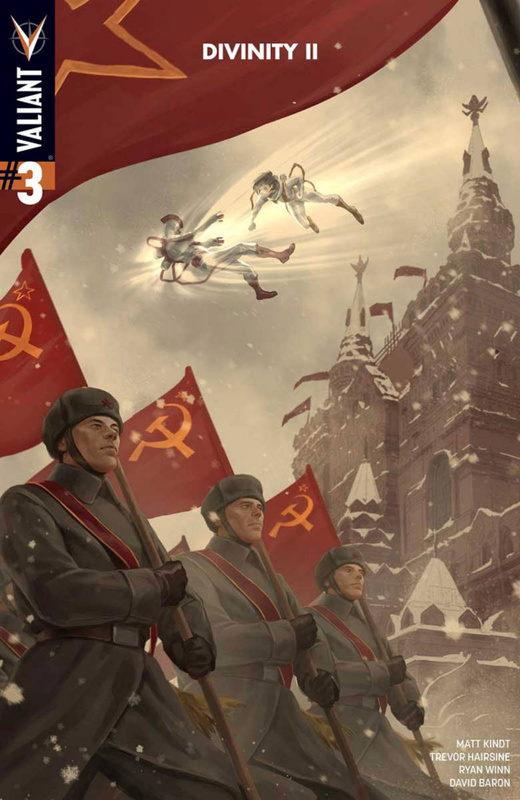 As the Western world grapples with the ensuing chaos and confusion of Russia's rapid return to power, Divinity and Ninjak attempt to marshal resistance against an empire enabled by the god-like will of one of its own true believers. But nothing escapes the sight of the super-powered gods that now walk among us...and our fate will be forever decided when Myshka targets Divinity for control of our world's destiny! The sold-out sci-fi saga that forever changed the course of the Valiant Universe turns the world upside-down all over again as New York Times best-selling writer Matt Kindt (4001 A.D.) and explosive artist Trevor Hairsine unleash an all-new chapter!